The default zone setting is far too narrow at the yellow zone in which I should be running most of the time in order not to overstress myself. 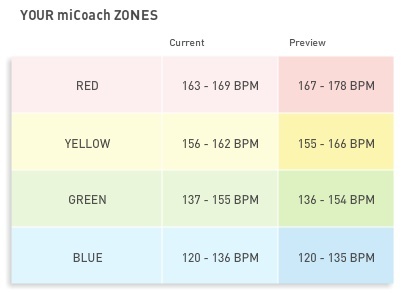 I believe the zone setting was generated automatically after the initial assessment workout. From above the yellow zone is 7 beats inclusive of its boundaries which is far too narrow. I manually set it again to have 12 beats so my target is not to run beyond 166 BPM. Below is today's record using the new zone setting.